My grandfather had a toy train set that was put out every year around Christmas. It must have taken hours; it took up the whole dining room. Regardless of age, toddlers through adults, watching the trains going in and out of the tunnels and around the little storefronts and homesteads provided hours of entertainment. It had been years since I’d experienced that when I took my 5-year old Inara to The Trains at Northpark this week. It was fascinating to watch a little girl whose interests usually run to Barbie and American Girl release my hand and take off to see all of the trains running along the tracks. 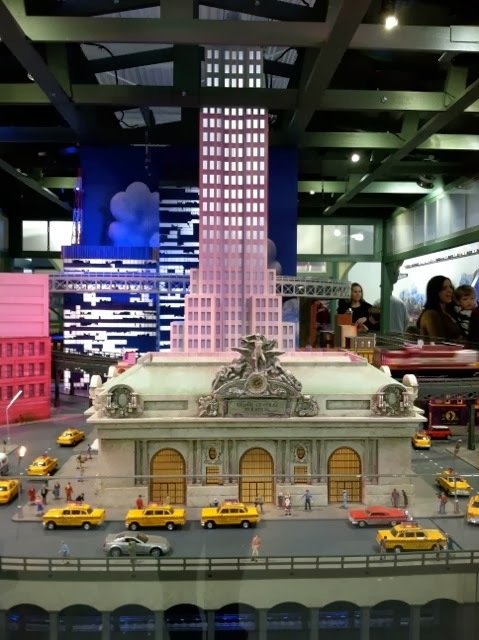 More specifically, twenty-six Lionel train sets rolling along approximately 1,600 feet of track, tucked into a retail space on the second level of NorthPark Center between Sephora and Free People. And with a ticket price of only $3 for children ($6 for adults; children under 2 are free), it’s the perfect afternoon diversion or break from holiday shopping. The exhibit is breathtaking. Personalized railcars purchased by supporters run through intricate replicas of American landscapes and cityscapes. Inara was particularly interested in the Albuquerque hot air balloons, the White, House, the State Fair of Texas and of course New York City’s Times Square and Grand Central Terminal (my favorite part too). The trains belong to the Ronald McDonald House Dallas, a home established in 1981 for families of seriously ill or injured children who travel to Dallas seeking medical treatment in area hospitals. The trains were donated (along with storage space for the off-months) to the house to use as their annual fundraiser, which currently provides the funds for almost a third of their annual operating budget. This year’s Kid Conductor is Bishoy Megally, a 6-year old from Egypt who was born with a severe condition and whose family chose Dallas for his three surgeries. His family stayed at the House for quite a while during his treatment, and has now relocated to the North Texas area so they can be near the fine medical facilities. 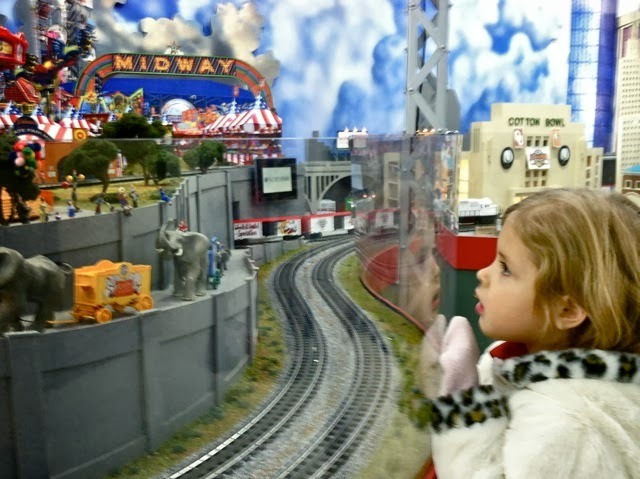 Presented by Bank of Texas, The Trains at Northpark is the most elaborate toy trains exhibit in Texas, visited more than 75,000 people each season.